“Lay me place and bake me pie, I’m starving for me gravy” – David Bowie. Know you now of days long past. What better way to spend this Bank Holiday Weekend than traipse through the Mall of Nostalgia?! 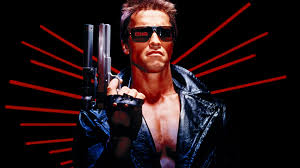 My life changed forever in mid-August 1984, when we acquired our very first video cassette recorder: VHS you understand (the cool one); the sole kid who often touted the “merits” of Betamax would invariably get beaten to a pulp by the bigger boys. From that hallowed point onwards, life revolved (spooled?) around tapes: tapes of action movies, tapes of TV comedy shows, tapes of planes, trains and automobiles for Dad, and ballet for Mum, tapes of this an’ tapes of t(h)at. Back then, you see, being able to watch a TV programme a day, a week – or months(!) – after its broadcast date shouted sheer genius! Possibly the main reason why best school-buddies: Ed and Boz dropped by my gaff at weekends, and during holidays, involved the double fix of excellent videos and scrumptious pies! In those days, our considerable larder came ram-packed with meaty goodness: steak and kidney, minced beef and onion… but one couldn’t stomach cheese and mushroom – still can’t. All supplemented by a kitchen drawer overflowing with potato chips of every possible flavour! If you – like me – are a child of the 80s, then you will know all-too-perfectly-well what this blogger is blatherin’ on about. “Don’t insult my intelligence! Please, don’t make me kill you… It will spoil all my fun” – Diana. For weeks, the latest sci-fi TV sensation from the States had been advertised. Just known as V – Earth’s first encounter with extraterrestrial visitors! Arriving in fifty motherships, they seek water and resources to save their dying planet, and in return they will bestow upon us all the fruits of their knowledge. TV cameraman Mike Donovan (Marc Singer) stows away aboard the LA mothership and discovers the shocking truth: they are reptilian invaders come to collect humans as food! The original 2-part opener thrilled me and Ed on the Monday and Tuesday nights respectively. 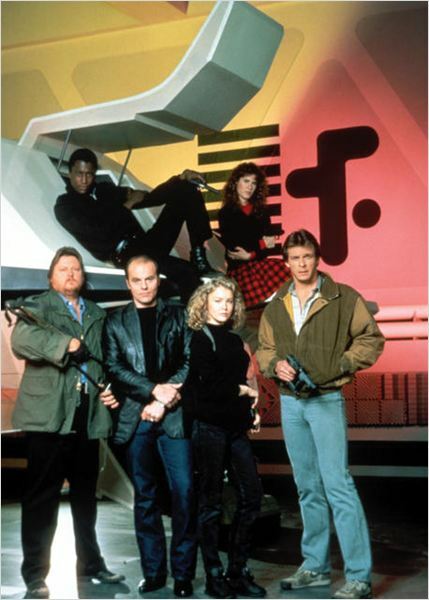 As it went out @ 10:30pm, Dad stuck around to check its suitability for us; he got swept along qith the engrossing drama and SF thrills, and – seeing how enraptured we younglings clearly were, he went out to purchase a VCR on the Wednesday morning. For that night, the 3- part series: V – The Final Battle began, and the whole caboodle got so much better. 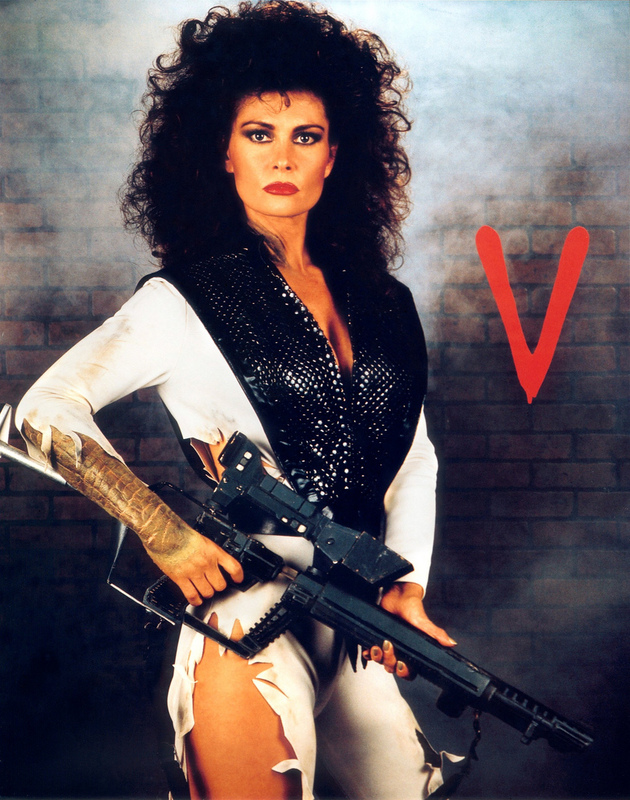 Another main reason to watch V, of course, was Jane Badler as scheming scientist: Diana – hotter than a pie that’d just come outta the oven. “Now that’s a waste of good luggage” – Ham Tyler. “Just give me some meat an’ a bowl a’ noodles, and make it snappy!” – Hsiao Feng. Back in the day, you could, inevitably, get titles so indescribably bizarre. Most of the titles on offer in Video Stop seemed to be rip-offs of either Alien or Mad Max. The latter – fantastically awful titles that had more cheese than, well, a cheese pie – already received somewhat “fervent” attention in this Post. 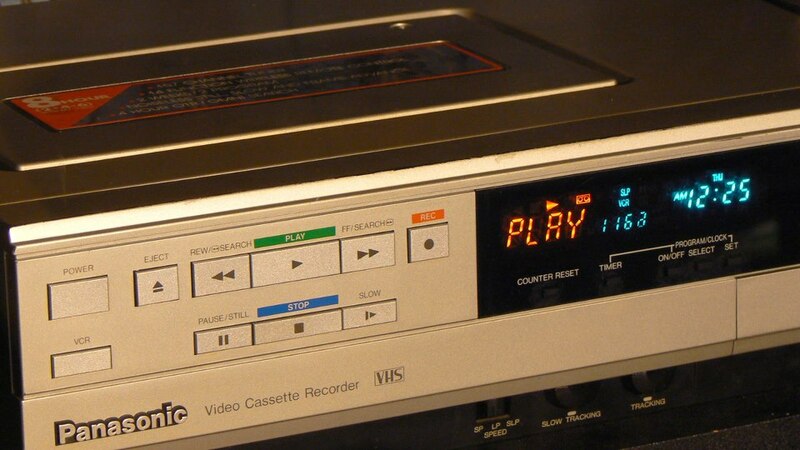 If a rental proved too turgid to sit through, one constantly-reliable go-to could always be slapped back in the VCR. Beach Of The War Gods – directed, and starring, that great Taiwanese action-star: “Jimmy” Wang Yu (yes! the one and only!) – is a gloriously hard and funky epic from the legendary Golden Harvest stable. During the 16th century, the Japanese laid siege to the Chinese coastline: killing, looting, burning and other frightful deeds. The petrified plebs of the Windy City dread imminent attack until-! He persuades Iron Man (yes! Iron Man!) and Brother Li Love (a moody paleface with twenty daggers strapped onto his tunic) to aid him in leading the locals to fight off the Jap hordes. As to be expected, the dubbing is hilarious, the foley artist is having a gas, and the surf guitar (yes! surf guitar!) soundtrack is outta sight, man! The climactic battle – hackin’-an’-a-slashin’ through the city streets – is faster and more furious than your average Chinese flick, featuring scintillating choreography, and it just keeps on going and going! “Anything you say can and will be held against you…in the court of Robocop” – Jerry. The box read: “Alien: Starring Tom Skerritt” written in black felt tip. Aha, that’s the bunny! methinks, me quest is over! Strangely, the screen opened, NOT on the dark, foreboding world of LV426, but in a brightly-lt bedroom. On a huge double-bed reclined three young women, with barely one bikini between them. The jittery vid-jockey lunged towards his VCR, an itchy finger quivering over the Eject button. It clicked; it whirred. The picture took FOREVER to switch off. 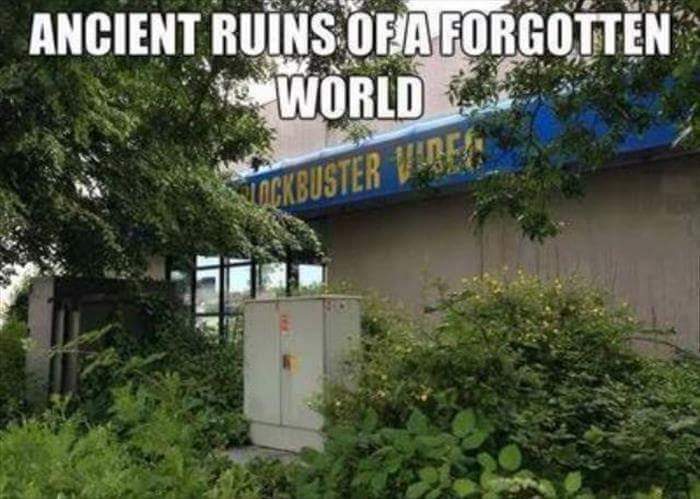 Remember only too well THAT looong, wretched slog back to Video Stop. Too embarrassed to glance at other passers-by – felt like they were staring at me with utter disgust. Imagine my utter relief to find, upon arrival, the lad-in-charge had popped out for a pie! The offending article could simply be dropped in the Returns box. Huzzah, my anonymity – not to mention my dignity! – remained intact! To be on the safe side, managed to avoid the store for a WHOLE WEEK so they wouldn’t be able to trace me back to that… that ghastly horridness. “Okay, who ordered the Burly Beef?” – Sarah Connor. My dear father and the joy of video rentals granted one of the most memorable birthdays of this boy’s life. Inevitably, Ed and Boz came round for my 14th – with cards and gifts (tapes, obviously). Two groovy fellas travel back in time to Los Angeles to hook up with the same clumsy waitress. And then the big guy gets blasted away. Uff, so what…? But then – SWEET BABY JESUS! – he only gets up and spends the rest of the movie chasing the other two across LA! Turns out that he – ha! get this: happens to be a cyborg, sent back to terminate that po’ woman presumably before she can do any more damage to that Diner. It’s the most ridiculous thing, but pulled off with such great gusto; the action is top-notch, while the pace? Relentless! You know its title; it’s become one of THE iconic SF greats of the 80s – and deservedly so. Dad was absolutely delighted to see me so happy, and – bless ‘im – only rented ANOTHER video! The awesome merits of Aliens appeared not so long ago in this Post. But what turned out to be really mind-blowing? 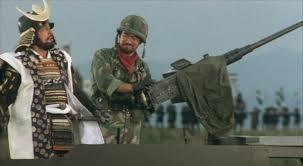 Corporal Hicks (Michael Biehn) is also a stalwart member of the the Badass Brigade – Hey! This is turning into quite a nifty reunion! Plus, Biehn had already showed off his pecs in that other Movie of the Day! A Michael Biehn double-bill – the perfect birthday present for anyone! “You could warn them… if only you spoke Hovitos!” – Dr. Rene Belloq. 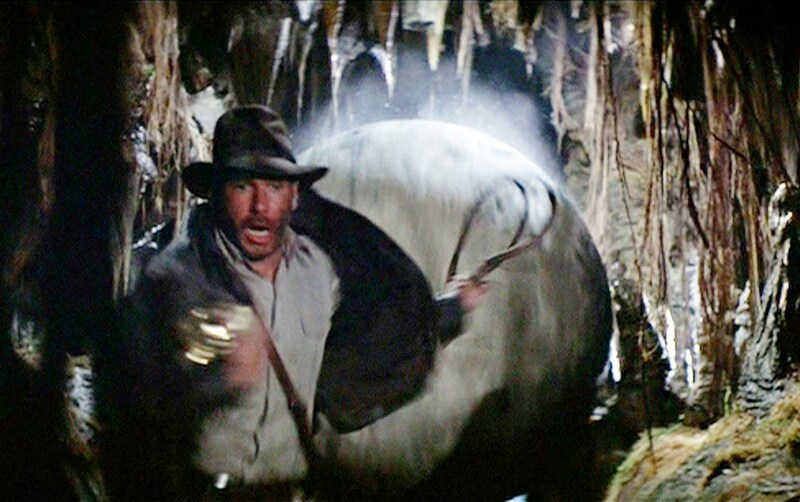 The BIGGEST movie of Summer ’84 had to be something called: Indiana Jones and the Temple of Doom. Knew that it was an old-fashioned action/adventure movie, but that was all. Until Ed clarified that it was actually a sequel to a blockbuster that caused a sensation back in ’81: Raiders of the Lost Ark. Not only promising the ultimate pie-eating experience, we reckon this was our VERY FIRST rental. Whoa, what a visual feast to get the ball – or, in this case, boulder – rolling! Best moment? 4:38 – ha ha! “Didn’t any of you guys ever go to Sunday school?” – Indiana Jones. That, my fellow thrill-seekers, wraps it up for this May Day Weekend. Since our TV set switched to a digital network, access to our video channel has become a bugger to fix; mould has damaged some of the tapes; Video Stop vanished long ago – the unit is now a softcore hardware store; those friends are long gone; Brad himself is still chooglin’. But his pecs are – by Jove! – still as firm and pliant as ever! “This may not be the best idea…” – Rhomann Dey. 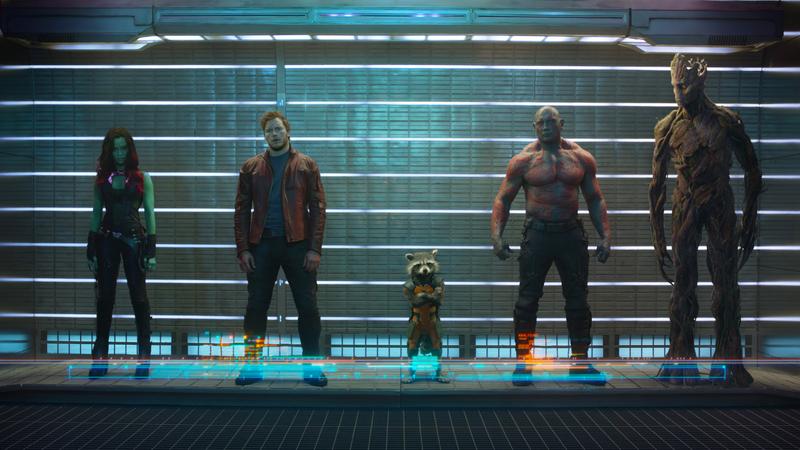 Back in the Summer of ’14, when Guardians Of The Galaxy – Marvel Studios’ biggest gamble, featuring a bunch of unknown misfits – defied all odds to become the most successful (and our favourite!) movie of the season, but we were crestfallen to learn that we would have to wait THREE YEARS for the inevitable sequel. Now! Guardians Of The Galaxy Vol. 2 opens next week, but here in the UK tomorrow. Eager to learn more about this cool cosmic combo – especially during these past few months – this blogger did what he does best: research. Was amazed to discover that, once upon a time, the Guardians HAD been a part of my infant reading time, although they existed in a different guise. “Drop the leg and return to your cell!” – Kyln Prison Guard. 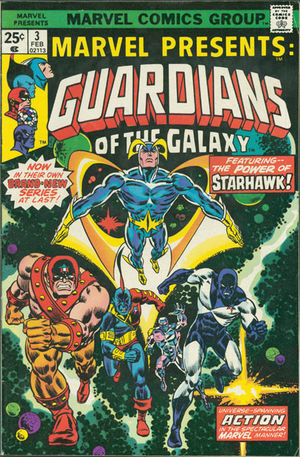 The original Guardians Of The Galaxy made their debut in the Marvel Super-Heroes #18 (January 1969), written by Arnold Drake and illustrated by the incomparable Gene Colan. They later starred in Marvel Presents #3–12 (Feb. 1976 – Aug. 1977), and were – apart from a certain Yondu Udonta – completely unrecgnisable from the irascible yet intriguing gang we embraced in the 2014 movie. 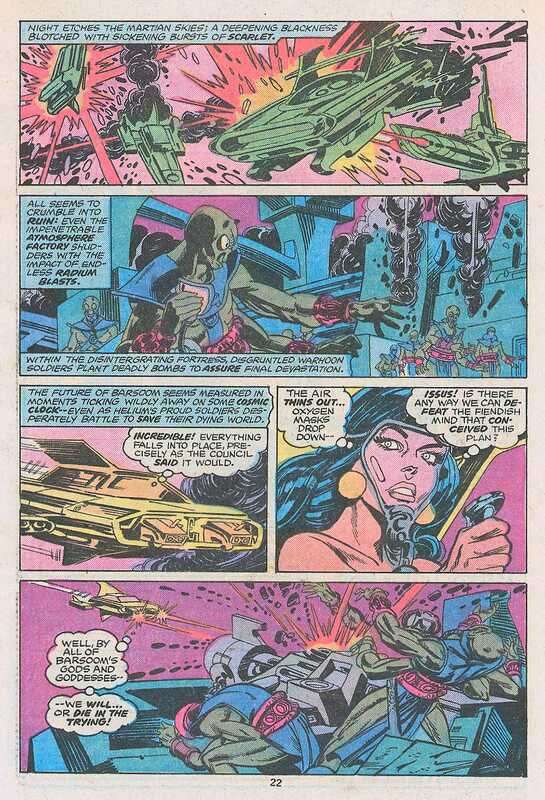 Strangely enough, these earliest strips were reprinted in (Marvel UK’s) Star Wars Weekly (1978). 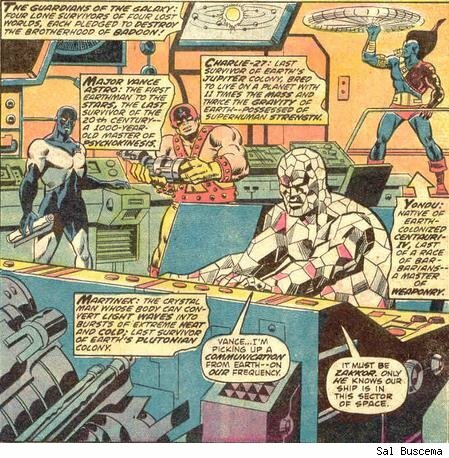 In later, sporadic appearances, they were aided in their ongoing struggle against the Badoon by such legends as Captain America, The Thing and the Defenders. The Guardians we know and love from the movie did not make their comics debut together until 2008, although each character had made separate appearances much earlier. Confusingly, Starlord also emerged in those same ishs of Star Wars Weekly, but with his own separate (reprinted) strip, illustrated by the great Carmine Infantino. “Do you got any other cute little buggers like this one? I like to stick ’em all in a row on my control console” – Yondu Udonta. 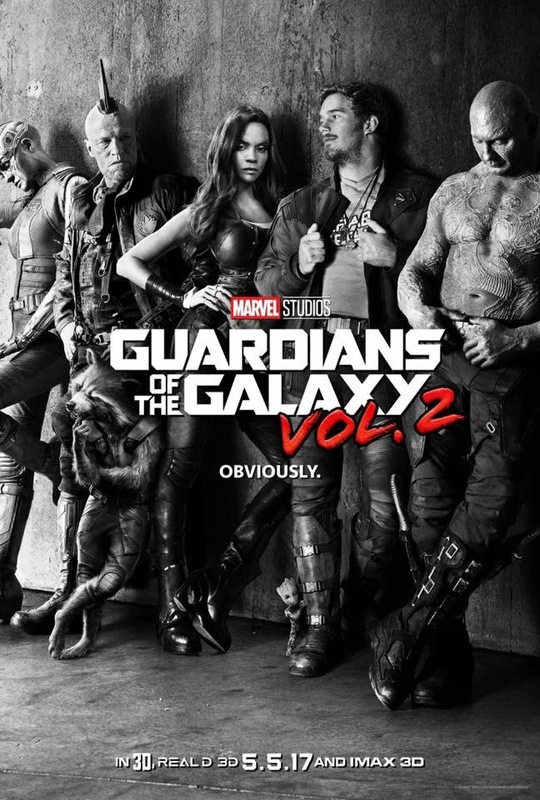 “What matters is telling a great story,” director James Gunn explained while discussing the eight-month writing process from which this sequel came to fruition. Encouragingly, he describes Guardians Of The Galaxy Vol. 2 as a continuation, rather than a replication of what thrilled us first time round. As you have probably surmised by now, Brad digs his SF quotes, and James Gunn (and Nicole Perlman!) did us proud with a cracking script full of witty and wonderful lines. So, naturally, one expects Vol. 2 to exude the same levels a’ fun and energy. Fortunately, early Reviews sound promising. What sounds really encoraging is the development of most, if not all, main characters, plus the introduction of a few interesting new faces, such as Mantis and Ayesha. Considering how all Gamora did during her big screen debut was just twist and shout, it would be great to see her do something more substantial. Also, one of the faults of the first film – Nebula barely making her mark on proceedings – will be rectified this time as she now appears as a new member of the team! 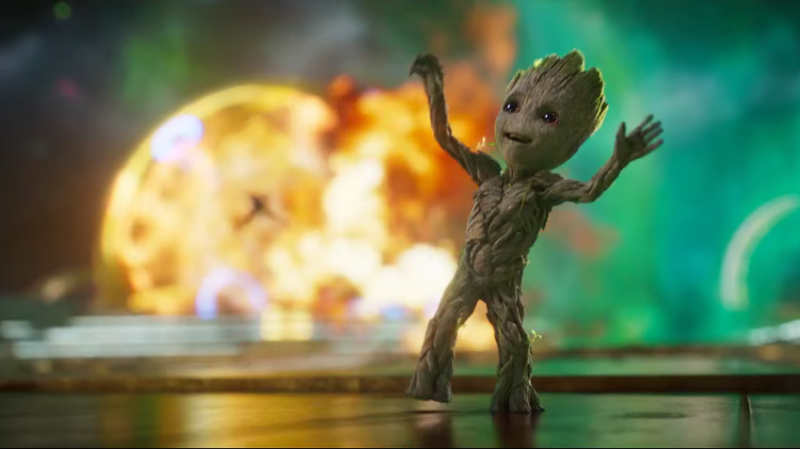 Yes, of course – and this goes without sayin’ – Baby Groot is just TOO ridiculously cute! Got Groot gifs gracing me Media Library already – and that ain’t a bad thing! All in all, be prepared to laugh loads. Last – and by no means least – you know what the MCU is like regarding its post-credit scenes: Vol. 2 has five – yes! Count ’em: FIVE!! – post-credit scenes! With Kurt Russell confirmed to co-star, people got excited over a potential Tango And Cash reunion. “Hooked On A Feeling! Blue Swede! 1973! That song belongs to me!” – Peter Quill. 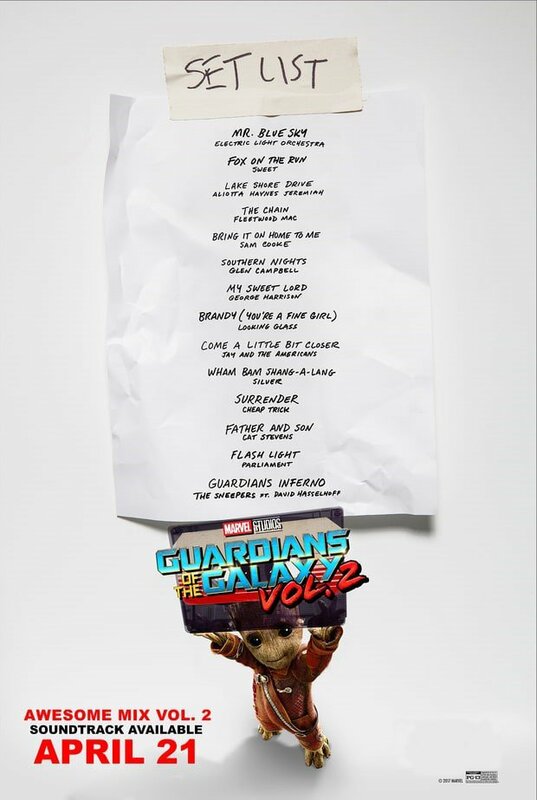 So, the long-awaited Guardians Of The Galaxy Awesome Mix Vol. 2 Soundtrack was released this past week. Three years ago, just like everybody else, yours truly compiled his own list, trying to predict what Mummy Quill’s Awesome choices might be. 1 & a half out of 14 – not bad, huh? Personally GUTTED that no T. Rex track made it. Cosmic Dancer describes Peter perfectly, doesn’t it? But after the big reveal of who/what his Dad is, Life’s A Gas came to mind: “I could have loved you like a planet” – eh, eh?! The Steve Miller Band was a crafty choice – in Peter’s case it’s: Take The Orb And Run – ha ha! And as for Jefferson Starship: that IS the tune Peter and Gamora dance to… surely?! Hey, hey, see how it all works together? Ha, ha, not just a pretty face, me! “I can’t believe I’m taking orders from a hamster…” – Denarian Saal. “I live for the simple things… like how much this is going to hurt! 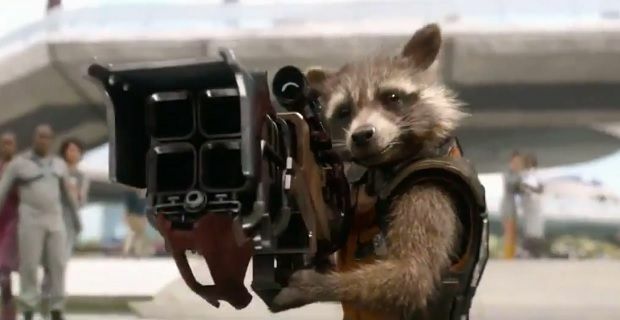 Yeah, writhe, little man…” – Rocket Raccoon. Manic Music Monday: Welcome To The Song A Day Challenge! Thank You To Danica For Nominating Me! Staying on the tea-and-scones side of The Pond, unbelievably, it is 22 years ago this month since the UK lost one of its most beloved comedy greats. 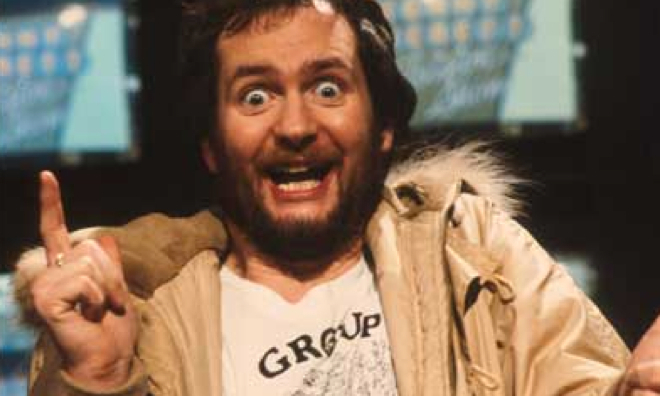 Kenny Everett began his madcap career as a radio DJ. From the late ’70s, and through most of the ’80s, his anarchic comedy routines and sketches dominated primetime TV. Camp, but not coarse, raucous, but not too racy, this naughty boy entertained millions of viewers each week. Bounding about with such an effervescent personality, we all believed the word: “zany” had been concocted especially just to describe him! Another Frenetic Excursion Through Bronze Age Awesomeness. “Easy with that pig-sticker! You and your buddy ought to be more discreet about where you have spats…” – E. Hammond Preiss. So wrote David Kraft, in an Editorial, snazzily titled: “Of Star-Gods And Sales Figures,” effectively announcing that this: Creatures On The Loose Featuring Man-Wolf #37 (June 1975), would be the final ish. Apparently, despite “doing well on the newsstands,” it hadn’t been doing well enough. Kraft explained that granting J. Jonah Jameson’s hairy star-cursed son his own book was given “very serious consideration,” but at that time, Marvel had already laid extensive plans to launch a variety of new series. Wonder if any of them reached the heights of Man-Wolf? With Kraft‘s script and George Perez’s art, the final ish of Creatures On The Loose is a rip-roaring yarn. Who knows if the savage progeny of the moon managed to land the spacecraft and save his friends on the last page…? And now, we take a rare venture into DC territory – from Man-Wolf to Ironwolf – hey, get that symmetry! “You’re no better than the Empress – you’re worse! 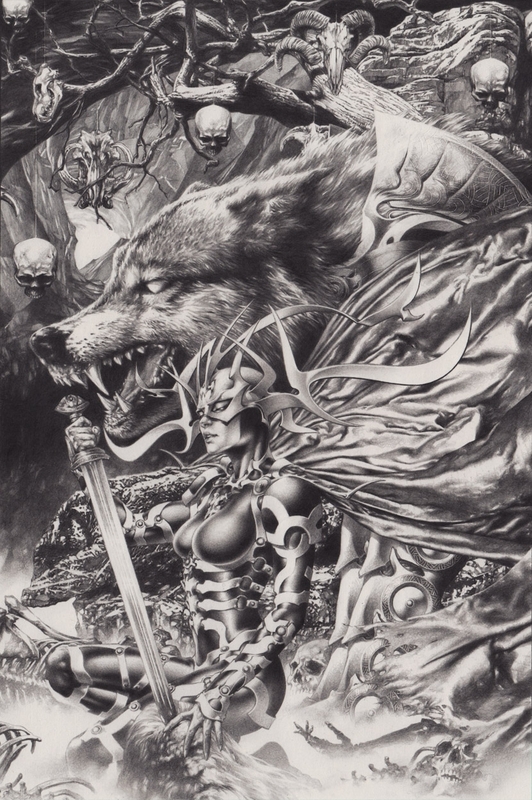 At least she doesn’t hide her evil behind fine words and gracious hospitality!” – Ironwolf. 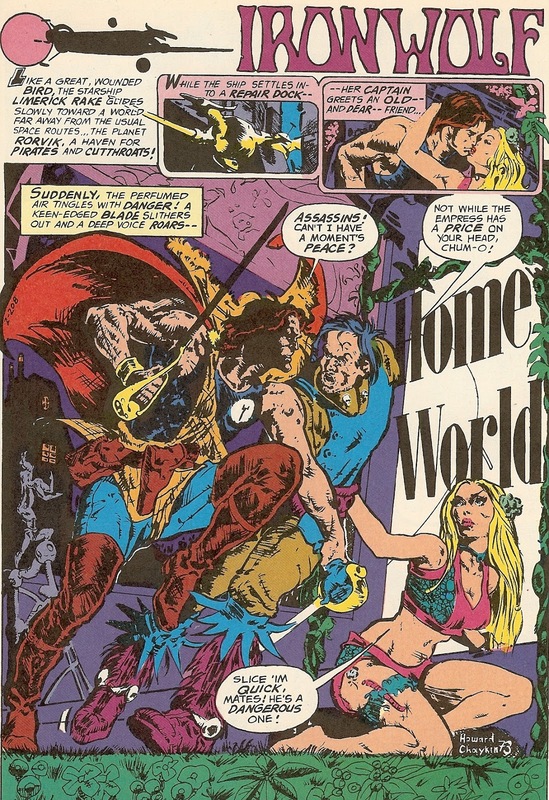 The tenth and final ish of DC’s Weird Worlds: Ironwolf #10 (November 1974), features an Editorial called: “Weird Words.” It states that despite being both a critical and commercial success, this title has to close – why? Hmm… your correspondent is NOT convinced. This “serious paper shortage” does not appear to have affected all the poor and underwhelming titles churned out – by both DC and Marvel, not to mention other indie publishing houses – during the intervening four decades (thus justifying my love and belief in Bronze Age books). “Fool! My defensive screens can easily neutralize your pathetic attack. Can you do as well against my ionic sword?” – Salia Petrie. “She’s forcing me into a corner and if her sword punctures the copper foil skinsuit under my costume, I’ll age a thousand years in a second!” – Vance Astro. The third selection in this eclectic mix also happens to be the final ish of a classic title unfairly terminated much too soon. 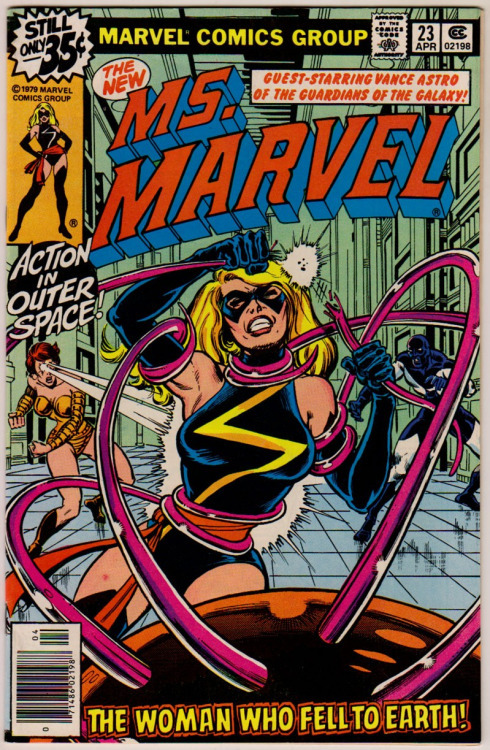 Three reasons drew me to Ms. Marvel: a woman as the central character; news of her own forthcoming movie; and perhaps the most obvious excuse: it was written by Chris Claremont – the same auteur responsible for making The Uncanny X-Men such a stupendous – and enduring – series. After acquiring both impressive and disappointing mags in this series, this ish: #23 (April 1979) is one of the best in the series. Abducted by The Faceless One and taken to the space station known as Drydock, she finds Salia Petrie – a fellow NASA colleague whose mind is being controlled by the cosmic villain. And there is a cameo appearance by Vance Astro, leader of the Guardians of the Galaxy – who will be all the rage in cinemas again next month! “You people kidnapped me, you seek to destroy our planet… Do you expect me to show you mercy? 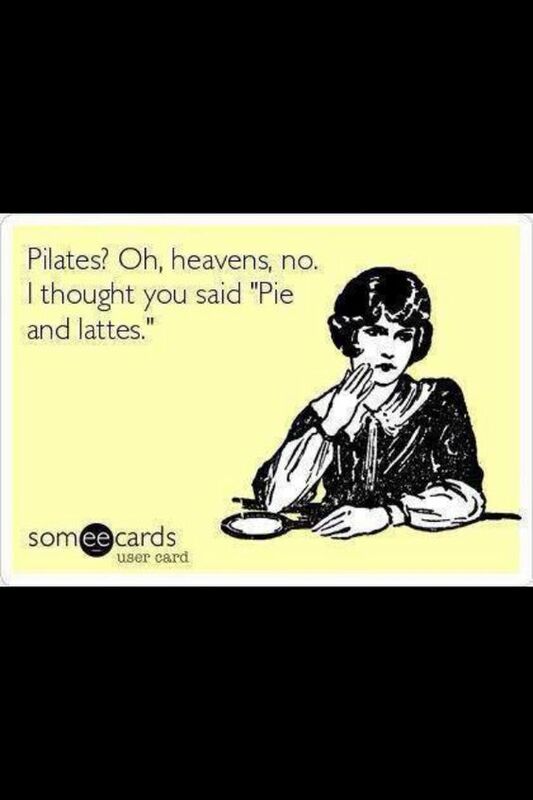 If so, forget it, fiends. There’s nothing I won’t do to stop you. Nothing!” – Dejah Thoris. “I have never been one write letters to the editor. However, something has come up that I cannot let pass. 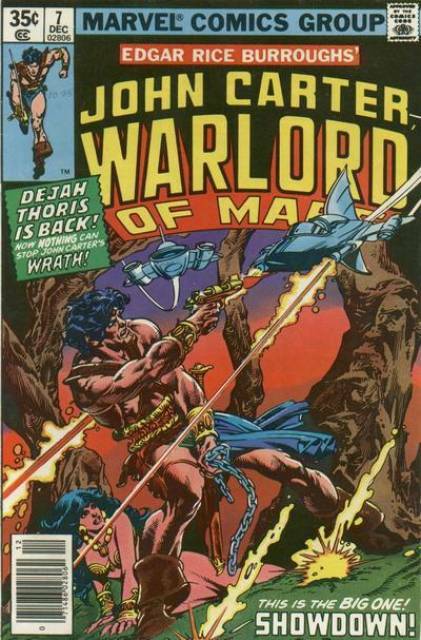 Simply put, the termination of John Carter of Mars, Warlord of Mars is an injustice,” stated one disgruntled reader, printed in #26 (August 1979) – the penultimate ish. On the strength of this exciting – and yet moving – mag, other copies have been sought this past few months. It was truly a great expedition when #7 (Decemper 1977) came into my possession, and at a reduced sale price too. A keen John Carter fan for most of my life, Marvel did a fine job on this series. This particular ish just happens to be blessed with the pulsating pencils of Gil Kane. And its title: Dejah Thoris Lives promises a suitably feisty appearance by one of science-fantasy’s most iconic princesses. 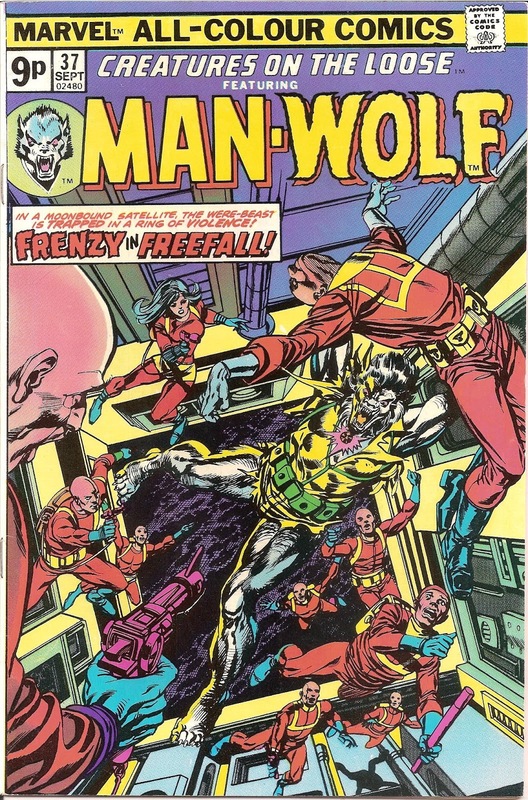 In the hands of that other exceptional Wolf: Marv Wolfman, this ish does not disappoint! “Awwright, ya flap-eared yahoos! Everybody git your tails inside an’ git them fishbowls off!” – Nick Fury. Stan Lee presents: A Stunning Saga Of An Alternate Reality, indeed! #14 (April 1979) boasts the incredible question: What If Sgt. 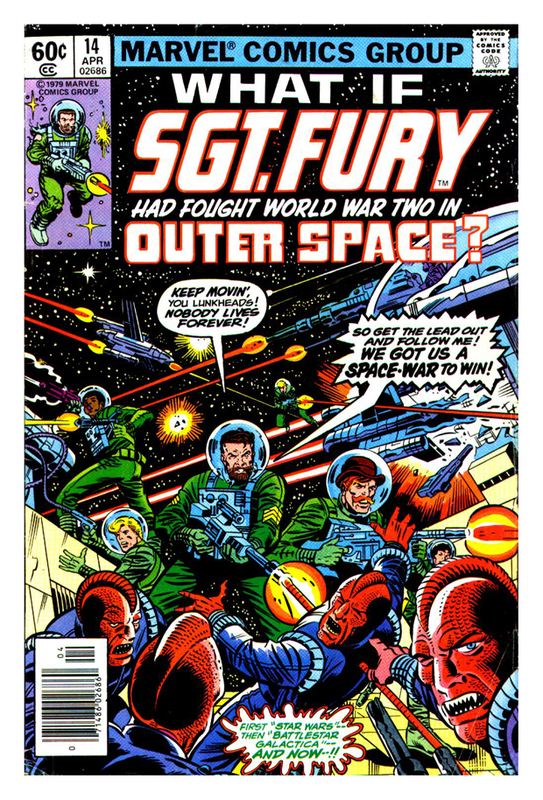 Fury Had Fought WWII In Outer Space? On the morning of 7 December 1941, the Pearl space station is attacked by a squadron of “crummy Betan lizards.” Such a bizarre premise proved too irresistible; plotted by Gary Friedrich, drawn by Herb Trimpe – and narrated by The Watcher of course! – this special bumper-sized edition is certainly unputdownable stuff! All the ishs featured here hold reserved places in my ever-expanding Bronze Age collection, although it is a shame that that it is their ephemeral nature that link them together. Ironically, the discontinuation of these titles has bolstered their value – not to mention made them more difficult to come by. At the end of the day, sales figures proved to be far more effective at crushing heroes than any nefarious plan concocted by the most devious costumed supervillains. Thankfully, David Kraft and George Perez were allowed to produce the two concluding episodes of the Star-God Saga in a couple of ishs of Marvel Premiere four years later. Kraft ended that editorial in 1975 by stating: “Doing this series has been a lot of fun for all of us here, especially George and myself, and we hope that you’ve gotten some entertainment out of it along the way. “I knew one of you super-creeps was responsible for this! Good or bad – you’re all the same…! You’ve got to be stamped out – no matter what the cost! And if J. Jonah Jameson has anything to say about it, you will be!” – J. Jonah Jameson. The Fall is Mark E. Smith. 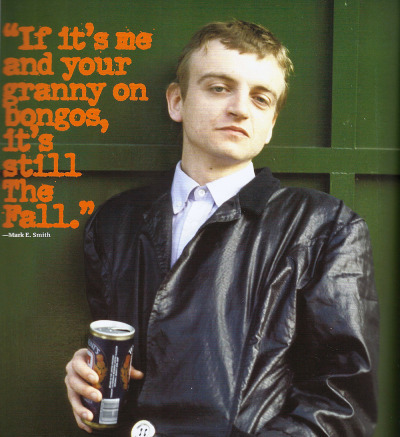 Mark E. Smith is The Fall. Over four decades, and having gone through about 66 band members – and countless artistic directions – this outspoken frontman, influenced by Can and The Velvet Underground (but hey! who hasn’t?) remains the only permanent member of this cult fave Mancunian band. As BBC DJ legend John Peel’s favourite band, The Fall’s album and session tracks received constant airplay. Their sound – embellished with those distinctive vocals – constantly veered between the weird and the wonderful, but there was NEVER a dull moment. 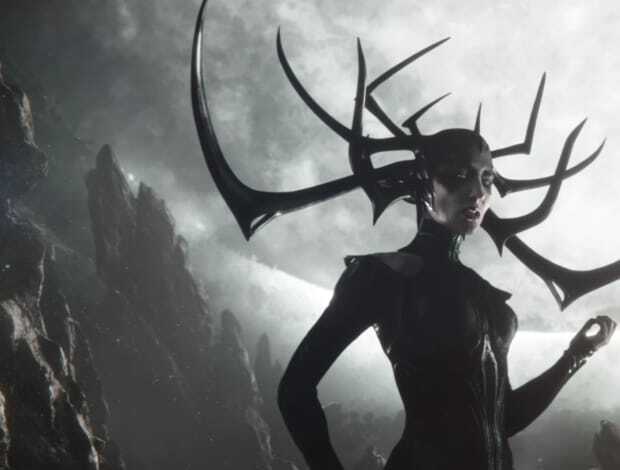 “Valhalla Be Mine!”: Could Hela Be The MCU’s Greatest Villain? “‘Tis Hela who is the power here – Hela whose word is Law! I be Death incarnate, Whitebeard, and Death dares all” – Hela. Ever since all of us were treated to the suitably awesome Teaser Trailer for Thor: Ragnarok at the start of this week, Brad has been mesmerized by Cate Blanchett’s devilish grin. Odin’s blood, methinks – this movie be not upon us for another seven months yet, but already anticipation for one of my all-time fave Marvel characters grows. Foolishly, ’twas thot that a Preview of Guardians of the Galaxy Volume 2 could be battered out this weekend – ha! Not e’en the giddy delights of a Star Wars teaser trailer wert enow to dissuade me from the fiendish allure of the Queen of Niffleheim – the Goddess of Death. This teaser sets up what appears to be a very promising outing for Odinson. As a huge fan of The Mighty Thor comic – thus sparking a lifelong fascination with Norse mythology – and reasonably satisfied with both solo movie ventures for the God of Thunder, a main drawback however (especially in Dark World) was the preponderance of scenes on Midgard (Earth). It appears that Grandmaster Feige and his merrie MCU band realised this and upped the ante accordingly to devise the gobsmacking cosmic adventure we deserve. “You who now come claiming my father’s spirit as though the soul of Odin were some bauble that you had won!” – Thor. 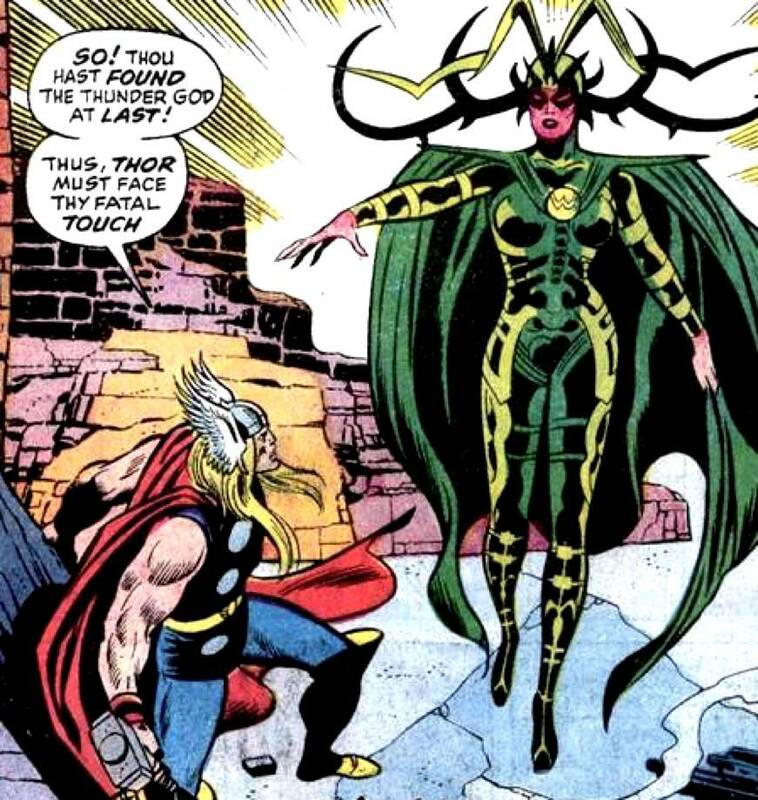 My introduction to Hela could not have come in a finer form; the main story in The Mighty Thor #314 (which takes pride of place on my desk this evening as these words are frantically typed) stands as a personal uplifting favourite, but it is the additional Tales Of Asgard bonus story: Judgement – And Lament! in which Hela has usurped radiant Valhalla, and – with her icy touch – remade it in the imge of her own cold, cruel and foreboding kingdom of Niffleheim. Tending to his fallen Valkyries, Odin – ruler of the gods – comes to set things a’right. And part soothing words to the Bringer of Death, enow to quell the anger and hurt within her. “Can you believe we’re having this conversation? It’s 2017 and we’re talking about the first female villain? It’s ridiculous. There’s so much untapped potential villainy in women. It’s really exciting. I think finally it’s beginning to be acknowledged that women and men want to see a diverse array of characters, and that’s race, gender across the sexual spectrum” – Cate Blanchett. What is it – for me – that sets the Queen of Niffleheim apart from other female characters in the Marvel canon? 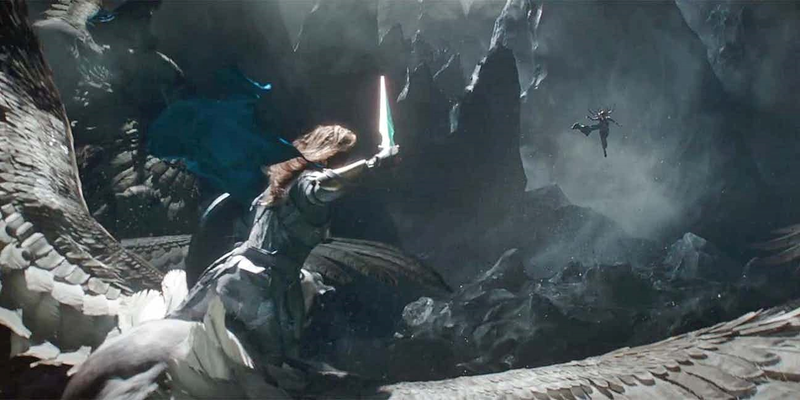 “She’s been locked away for millennia getting more and more cross,” as Blanchett explained in a recent interview, and she is bent on exacting her vengeance against Thor. And Odin. By not only holding Mjolnir, but destroying it(! 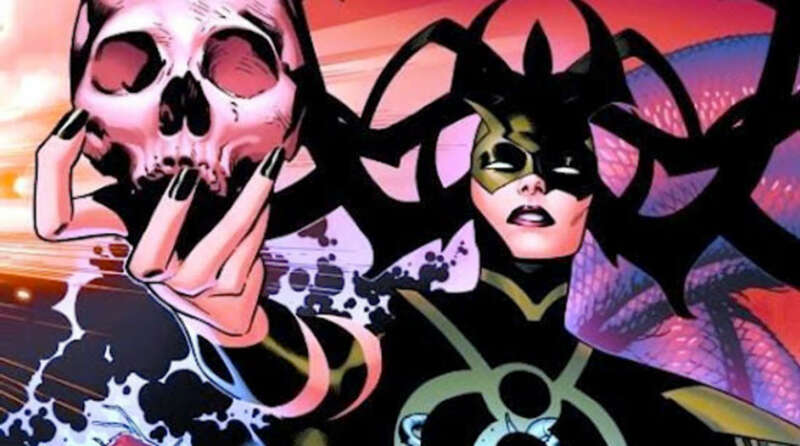 ), Hela makes quite an impact; her intentions of unleashing Ragnarok – the fabled destruction of the gods – are machinations not to be taken lightly! Verily, from what we’ve learnt this week, she is shaping up to be quite a formidable antagonist indeed. And to think that, up until this year, Loki has stood as the MCU’s most dangerous evil presence. With barely any competition. Ant-Man’s Yellowjacket was underwhelming, and Guardians of the Galaxy’s Ronan The Accuser merely spent his screen-time sulking rather than exuding adequate menace. And – although promising to “bathe the star-ways with your blood” – we have yet to realise the full extent of Thanos’ power. But surely, without terrifying headgear, can he muster the right modicum of imposing threat…? “And thou wilt understand the way of the world” – Odin All-Father. “Oh, I can’t get it together!” – Viv Stanshall. 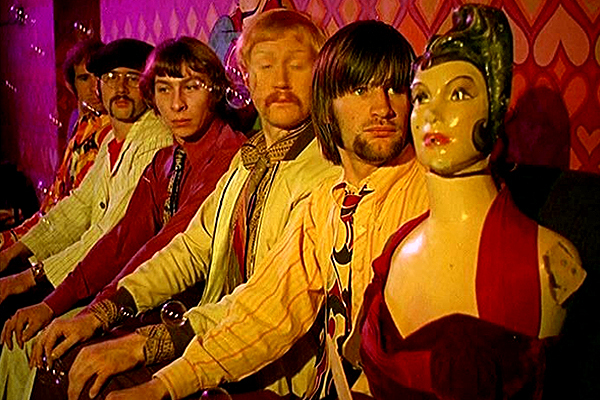 During the ’60s, Viv Stanshall and those crazy boys of the Bonzo Dog Doo-Dah Band maintained that tradition of eccentric English humour richly expressed by the likes of Peter Sellers, Spike Milligan, Monty Python et al. The song is odd, funny, poignant and quite effervescent, rather like love itself.